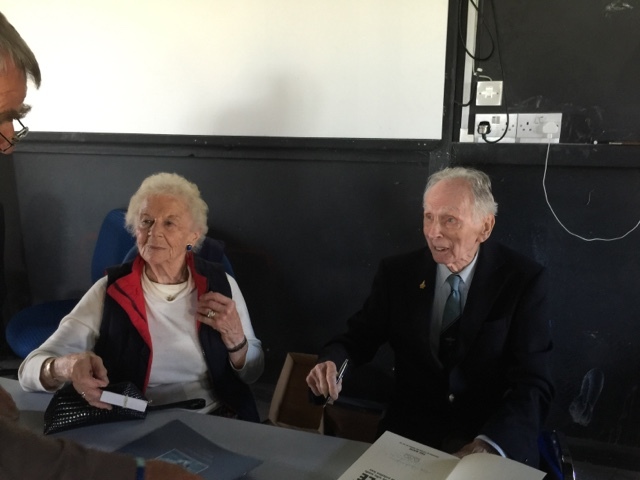 Winkle Brown - he is called Winkle because of his short stature - is ninety-six and one of the most remarkable people alive today; not least because he survived being the greatest test pilot there will ever be. I shook his hand last week. Over his career he flew 487 different types of aircraft - this was as pilot-in-command and only counting one Spitfire when he flew ten different marks of that aircraft - all with quite different characteristics. The war years threw up so many new aircraft that this record is never likely to be exceeded. Computers and sophisticated wind tunnels have now taken out so much of the risk that test pilots then took on - too often fatally. He was the first pilot to land both a tricycle undercarriage and a jet on a carrier and has more carrier landings than any other pilot ever. He went over the side of a carrier fifteen times (think about that) and bailed out twenty-one times. He used to instruct carrier landings sitting in the back seat with no duel controls. Think about that also. His carrier was sunk underneath him in the early part of the war and he was one of only two survivours. All this is remarkable enough but his spoken German gave him other extraordinary experiences. Before the war he met, and become friends with, Ernst Udet, the legendary WW1 fighter ace, who took him flying and inspired his career. He found himself in Germany on September 3rd 1939 but the SS let him across the border with his MG sports car as they said they would not be able to get any spares for it. In 1944 he met with Churchill who tasked him with capturing as much German jet technology as he could get his hands on. As a consequence he found himself with the with the advancing British army and in demand as an interpreter - of captured high ranking Nazis. He met Himmler before he poisoned himself and spent some time interrogating Goering - pilot to pilot. He said that the Americans who were holding him had stripped his uniform of all insignia and called him Herr Goering. Winkle spoke to him as 'Reichsmarshal'which puffed his vanity and got him talking. At the end of the meeting Goering put out his hand. Winkle knew he couldn't shake it in front of the Americans so he said, in German, the pilot's equivalent of 'break a leg'. The Reichsmarshal laughed and withdrew his hand. He fulfilled Churchill's mission and captured examples all the German jet aircraft, including the Komet - the rocket plane that was so dangerous that allied pilots were forbidden to fly it. That didn't stop Winkle Brown adding it to his logbook. How did he survive? Much luck and huge skill. Also, he said, his short stature that at three critical moments allowed him to tuck his legs under the seat when the front half of the cockpit was crushed. His wife, also in her nineties, was a ferry pilot during the war. These women would climb into completely unfamiliar aircraft and, armed only with the 'Pilot's instructions' handbook and fly all over the country in all weathers with enemy aircraft about and only basic navigational aids. What a privilege it was to meet such a man - and his wife. It was history bought alive - only one degree of separation from the some of the epic events and people of the terrible 20th century.